Update: Grace is now 4 years old and doing well. 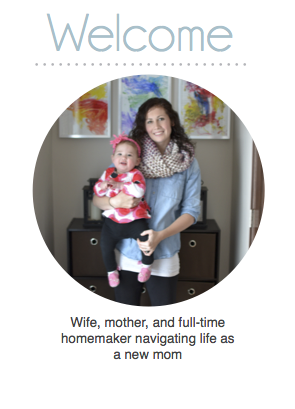 She is keeping up with all of her peers just fine and is doing all of the things preschoolers do. She loves participating in physical activities. Currently she is enrolled in swimming, gymnastics, ballet, and soccer and I have seen no negative effects from her feet. In fact no one would ever suspect there was anything wrong unless they looked very, and I do mean very closely at her feet. When Grace was 2 months old I lugged her to her 2 month well visit. I had the same concerns as any new mom. Is she eating enough? Is her development on track? Why does she not sleep at night? etc. However, I never considered that there was any real reason to be concerned. The pediatrician examined Grace from head to toe and then suddenly stopped at her little feet. She moved Grace's feet, this way and that, without saying a word. It seemed like hours before the doctor finally turned to me and told me that her feet were abnormal and she suspected clubfoot. In that moment the life I envisioned as a new mom was shattered, and the new reality of doctors and specialists began to take over. I left the office that day with a ton of questions, fear for the future, and a referral to an orthopedic surgeon. We drove the 40 minutes to meet with the orthopedic surgeon and were ushered into a waiting room. There we met some amazing families who had children with challenges far greater than Grace's, yet, it was still heard to fathom that this was my new reality. This sort of thing happens to other people. Not to me. 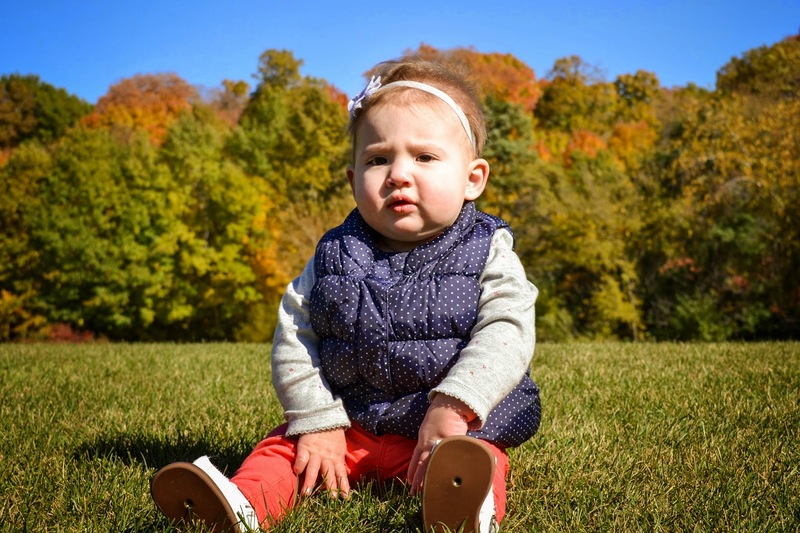 When we saw the surgeon he diagnosed Grace with non-flexible metatarsus adductus, where the front half of the foot is turned inward. It occurs in about .1% of all births and is thought to be caused by the way the child is positioned in the womb. We were assured that often times the feet will straighten on their own over time, and rarely do the children need casts or braces. In fact, I was even informed that Anthony had this very same condition when he was born. Thanks for telling me now, sweetie. With this new information I thought I would feel better. The surgeon had just told me that we did not need to do anything. Grace was fine. However, I had a bad feeling. Grace's feet were monitored for two months and over that time they did not seem to be getting any better. 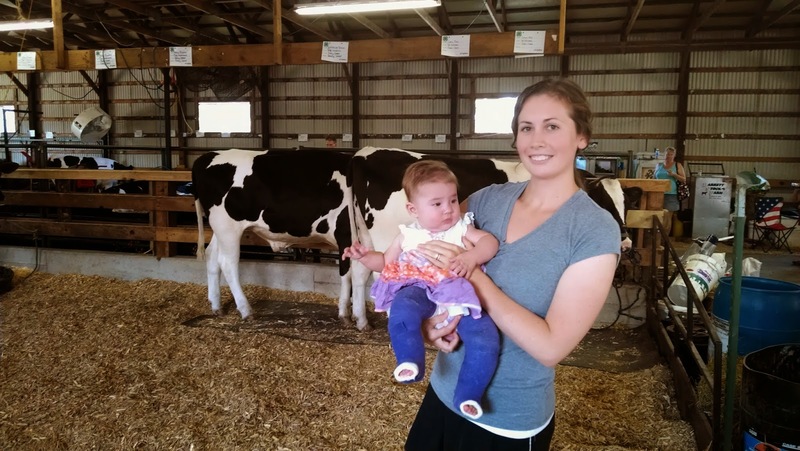 At 4 months old she was sent for an ultrasound to make sure that she did not have hip displasia, as it is common with metatarsus adductus. Upon receiving a clean ultrasound the doctor decided it was time to treat her feet, and would do so using a technique similar to the Ponsetti method for clubfoot. Every week Grace would receive a new full length leg cast. These casts would stretch her foot little by little until they could easily be placed into a neutral position, and we were told she would get her first cast that very same day. I had a feeling this was going to happen, but it was still a shock to know that I would not be seeing her little piggies for sometime. On the way to the casting room I was so nervous about how Grace would tolerate them. However, she did great. Not a tear was shed during the long casting process. That night she was a little fussy because she couldn't find a comfortable position to sleep in, poor baby. The casts luckily didn't slow her down one bit. She was still rolling all over the house and still my smiley baby. I, on the other hand, had a much harder time adjusting to the casts. It is no fun to see your little child with two bulky casts on their legs, and it is not easy to cuddle them with the casts poking out. 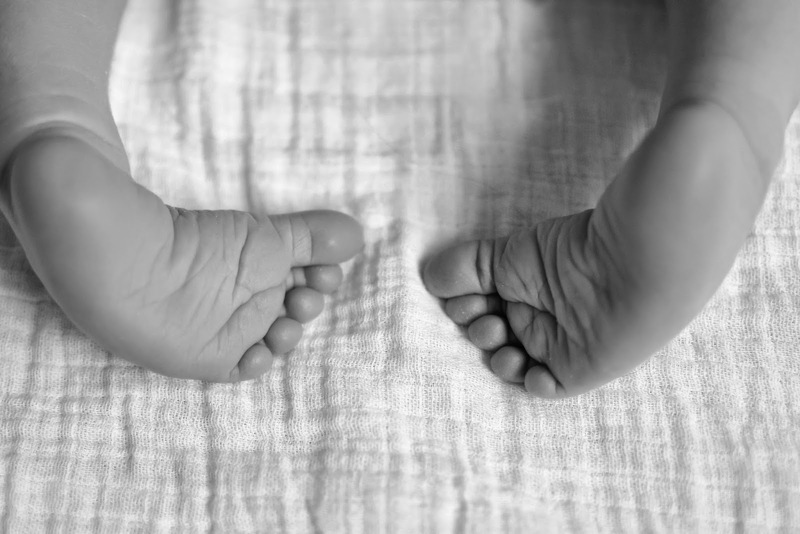 I yearned to see her tiny toes again, and hold her without the plaster between us. A week later we returned to the doctor to get a new set of casts. When the casts were removed Grace was so giddy. She wouldn't stop kicking her legs. This time she got new purple casts and I was determined to keep them clean. The white casts were so gross looking by the end of the week. This time the casting process was no big deal. We had been through this before, and since Grace did so great her first week, I was completely unprepared for the weeks ahead. Grace is a little squirmer even with casts. Her favorite new activity was to make music by banging her casts repeatedly on the ground. One day while I was holding her I felt her casts, and they were soft. 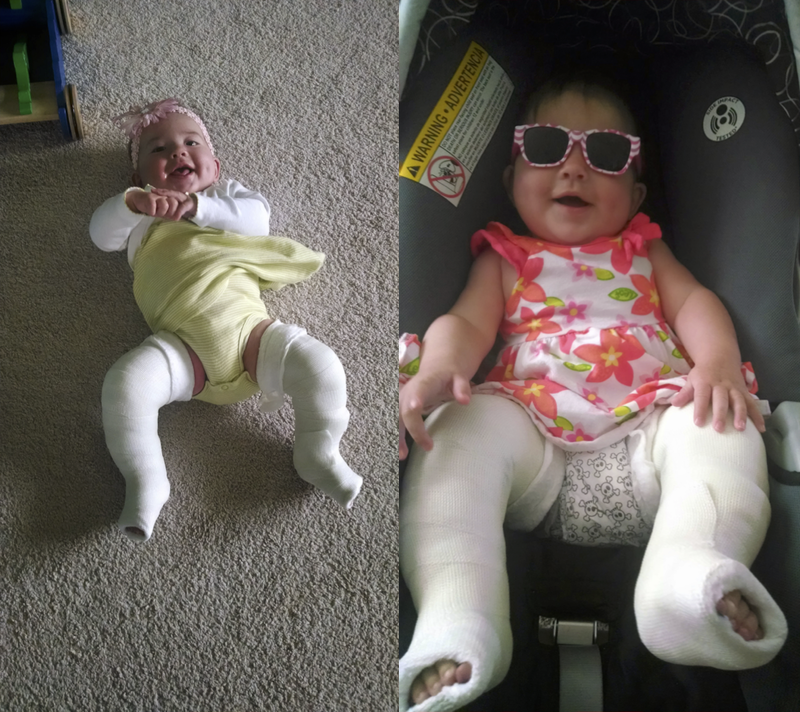 Yes, my 4 month old had broken both of her plaster casts. Back in the car we went for the second time that week to the clinic. We had to get them changed immediately to make sure she would not get sore on her feet. When they removed them they not only found where she had broken the casts, but also found some irritated skin behind her knees. In order to allow the foot to heal we got a week off from the casts. Yay! Grace was so happy to have her mobility back. Of course, taking a week off from casting has its downsides. There was a possibility that her feet would regress and we would need casts even longer. Sporting purple casts at the county fair. If you can't tell, I am terrified of cows. The next week her skin had healed, thankfully, and it was time for another round of casts. However, this time instead of laughing and giggling while they put on the casts, Grace was screaming. She stopped once the casts were on and was fine all afternoon. However, nighttime was a different story entirely. Every hour that night she would wake up screaming, but would calm as soon as we picked her up. Originally I thought the crying was just from adjusting to the new casts again. Her very first night with casts didn't go great either. By the third or forth time she woke up I started looking for other reasons for her discomfort. Every time we would leave the casting room they tell us to check the placement of her toes to see if the casts had slipped as this could be very painful and needs to be dealt with immediately. So, of course I kept checking to see if her casts were slipping, but they weren't. Eventually, she finally fell asleep and we did too. The next day, however, she was worse. She wanted to be held at all times, and would cry if I set her down. In fact the only time she wasn't crying was when I would hold her. This was not my sweet easy Grace. I knew something was wrong. Finally, she got so worked up she tried to pull her foot out of her cast, and I phoned the nurse line. Unfortunately all the nurse did was give me an appointment time for the next morning, but I knew Grace couldn't wait. By now she was absolutely hysterical and I decided I needed to do something, now. They had shown me at the clinic how to remove the casts if I ever needed, so that is what I did. I stuck her in the bathtub and I felt like I couldn't soak the plaster off fast enough. When the casts finally came off I found out why she was screaming. She had a huge open sore on her foot from the casts rubbing. At this point I felt like the absolute worst mom in the whole world. However, once those casts were off, she settled down and went to sleep. The next morning at our appointment the doctor decided that Grace would not have anymore castings done. He was not getting the results he wanted, and Grace was obviously not tolerating them well. We were going to move on to straight last shoes, but first her foot needed to heal and I needed some time to recover emotionally from our ordeal. A couple weeks later Grace got her new shoes, which give the same effect as putting your shoes on the wrong feet, and I couldn't have been happier. It was so much easier to take care of Grace without the casts, and I know she enjoyed being able to move her legs again. We had a few issues the first week as some how my little Houdini seemed to get her shoes halfway off all the time. However, after a few adjustments we finally got them to stay on. She would wear them for 23 hours a day for four months, and by the end her feet were finally able to be stretched into a neutral position. This was a huge milestone for us. However, her feet remained turned in when relaxed. When Grace started pulling up she decided she didn't like her shoes anymore. Over the course of a month or so she tolerated them less and less until the doctor gave the go ahead to discontinue them. Her feet are still turned in, but we hope that as she starts to walk and grow they will straighten out by themselves. The doctor says as long as she is not tripping over them all is okay for now. Not the most comforting statement. She gets reevaluated in a couple months and I am hoping for good news. Fingers crossed. Thank you for sharing your story. 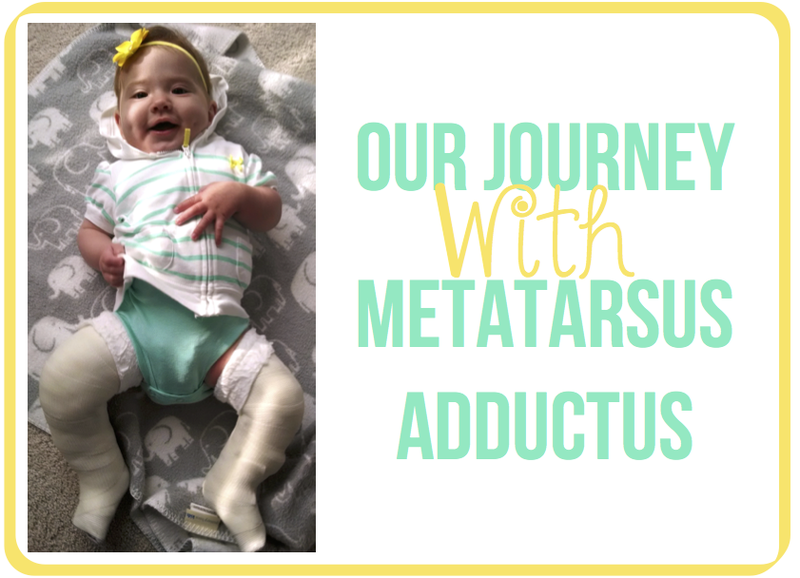 My son didn't get diagnosed with metatarsus adductus until his 15 month checkup and even then the dr didn't notice, I mentioned that I didn't remember my other kids feet turning in still at that age. His feet are able to be stretched straight so his ped refered us to a physical therapist and said we'd probably have to do stretches with his feet. I was heartbroken when the PT told me he would need braces to correct...and that he's bowlegged but nothing will be done about that unless it is still there when he's 5 (I have to wait and worry till he's 5?!) He has an appt to be fitted with the braces tomorrow. I really know nothing about braces, so I guess I'll be learning a lot tomorrow.